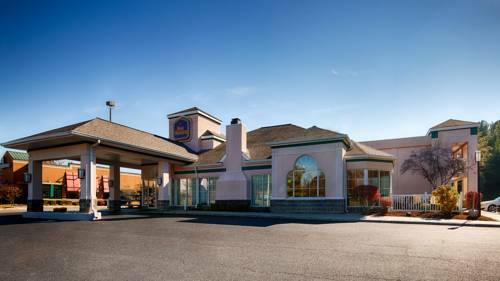 The Best Western Lexington Inn, centrally located in the heart of Virginia's Shenandoah Valley, offers superior customer service, affordable rates and all the comforts of home, which guests have come to expect from the Best Western brand. Lexington is full of historic sites, natural wonders and plenty of excitement. Within a few short minutes of the Best Western Lexington Inn, you'll find Robert E. Lee's and Stonewall Jackson's final resting places, the beautiful scenic Blue Ridge Parkway, Virginia Military Institute, Washington and Lee University, Southern Virginia University and the Virginia Horse Center. Guests of the Best Western Lexington Inn will find that each guest room at this pet-friendly hotel offers cable satellite television with HBO, complimentary high-speed internet access and exterior corridors, for your convenience. Other amenities include an on-site exercise facility, full service business center, meeting/conference space and a complimentary full hot breakfast each morning. We are also adjacent to a Free Tesla Super Charging Station. Whether traveling for business or pleasure, our guests are sure to appreciate Best Western Lexington Inn's quiet surroundings, friendly staff, scenic views and close proximity to all that Lexington has to offer. Book a stay at the Best Western Lexington Inn and save today! From: THE NORTH TAKE INTERSTATE 81 SOUTH TO EXIT 191. TAKE INTERSTATE 64 WEST 1 MILE TO EXIT 55. TURN LEFT AND THE Best Western LEXINGTON INN IS ON THE LEFT. From: THE SOUTH TAKE INTERSTATE 81 NORTH TO EXIT 191. TAKE INTERSTATE 64 WEST 1 MILE TO EXIT 55. TURN LEFT AND THE Best Western LEXINGTON INN IS ON THE LEFT. From: THE EAST TAKE INTERSTATE 64 TO EXIT 55. TURN LEFT AND THE Best Western LEXINGTON INN IS ON THE LEFT. From: THE WEST TAKE INTERSTATE 64 EAST TO EXIT 55. TURN RIGHT AND THE Best Western LEXINGTON IS ON THE LEFT. Across the street from Country Cooking, Full Service, American, Open for: lunch, dinner, 10:00 a.m. to 11:00 p.m.
0.50 mile(s) from Ruby Tuesday's, Full Service, American, Open for: lunch, dinner, 10:00 a.m. to 11:00 p.m. Adjacent to Applebee's Grill and Bar, Full Service, American, Open for: lunch, dinner, 10:00 a.m. to 11:00 p.m.
1 mile(s) from Local Main Street Shops, A variety of local shops offering local arts and crafts. 15 mile(s) from Goshen Pass, A local favorite spot for rafting, canoeing, and swimming. 1.00 mile(s) from Lee Chapel, Final resting place of Civil War General Robert E. Lee. 3.00 mile(s) from Stonewall Jackson Cemetery, Final resting place of Civil War General Stonewall Jackson. It's Yankees vs. dinosaurs in this alternate history view of the Civil War. The South wins! Another crazy attraction from Mark Cline, builder of Foamhenge. Opened July 2016. For those who still remember the TV series. Schuyler is the home town of the guy who wrote the Walton's books (and narrated the shows). His name was Earl, not John-Boy. Formerly known as the National Radio Astronomy Observatory. Giant dishes point heavenward in a place where you shouldn't count on mobile phone service. The Visitors Center features the first radio telescope, and fragments of one that collapsed. Ex-frat boy dies romantically in battle, gets a statue that would make any frat boy cringe.